Have you ever stretched the truth a little? Told a white lie? Be honest now. You must have — and maybe it was even well-intended to protect your feelings or someone else’s. What about when we lie…to ourself? Studied: Why We Lie to Ourselves When We Make Mistakes-To preserve our belief that we’re good people. CAMPING OUT… Or you will need to live with the imperfection. IMPOSSIBLE: You can’t sell something or get rid of something you do not own. THE WORD: Get rid of it! REALITY: YOU SHOULDN’T AND DON’T NEED TO CARRY THIS. Negates Jesus? If not are we saying Jesus’s blood isn’t enough? Ephesians 2:7 so that in the ages to come He might show the surpassing riches of His grace in kindness toward us in Christ Jesus. Refill: 2 Chronicles 7:14 if my people who are called by my name humble themselves, and pray and seek my face and turn from their wicked ways, then I will hear from heaven and will forgive their sin and heal their land. THE GIFT: Give thanks for it! BASED ON HEART NOT PERFORMANCE: Hebrews 4:12 For the word of God is alive and active. Sharper than any double-edged sword, it penetrates even to dividing soul and spirit, joints and marrow; it judges the thoughts and attitudes of the heart. FREEDOM: 1 John 1:9 If we confess our sins, he is faithful and just and will forgive us our sins and purify us from all unrighteousness. HEALING: 2 Chronicles 7:14, If my people, which are called by my name, shall humble themselves, and pray, and seek my face, and turn from their wicked ways; then will I hear from heaven, and will forgive their sin, and will heal their land. THE CHOICE: Go for it! Please download your FREE coaching tool to get busy moving past the mistakes of yesterday and by overcoming the world with Jesus. LET ME HELP- Get your ‘Confess & Catapult’ FREE coaching tool! Jacob: Can you help me figure out what to do. I know I messed up things for me, my children and my whole family. Don’t get me wrong I’ve done what I can to change, God is a big part of that but I keep feeling the need to make things right with my ex-wife. I was horrible to her, unfaithful, I tore our family apart. I was stupid, a kid, and thought only of myself. But I keep thinking I am holding her back by her thinking she deserved to be treated that way or that she wasn’t worthy enough…I really don’t know how I feel but I just think I am supposed to make it right. Should I try or just pray and let God do what He thinks is best. Kyndra: I see my grown children struggle and it is killing me.I just didn’t realize as I was raising them how much they needed or even I needed God in their/my life. I do now. My husband died early and my church, which I barely gave my time to was who ended up being there for me. The kids were long gone and I am more adjusted, healthy and stronger than I have ever been. That’s going to do it for this episode of Living Within the Sweet Spot. Before we wrap up I want to encourage you to stay connected on Facebook, Instagram, LinkedIn and please subscribe to my Itunes & YouTube channel. 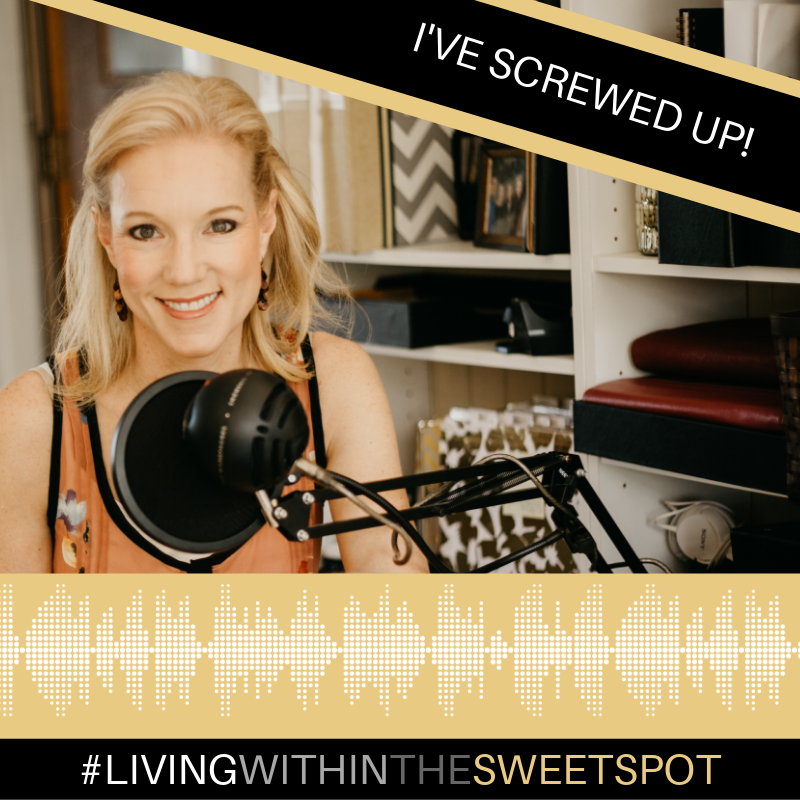 See you next week on Living Within the Sweet Spot. Faith Infused Living…Reaching Goals Higher!